Other versions: NS; XONE; PC. It’s nice, now and then, to recapture the days when a box would jump out at you from the shelves of your local games shop. Sometimes it’s the distinctive art style that draws the eye, or a premise so wild and outlandish, it practically demands your money on the spot. 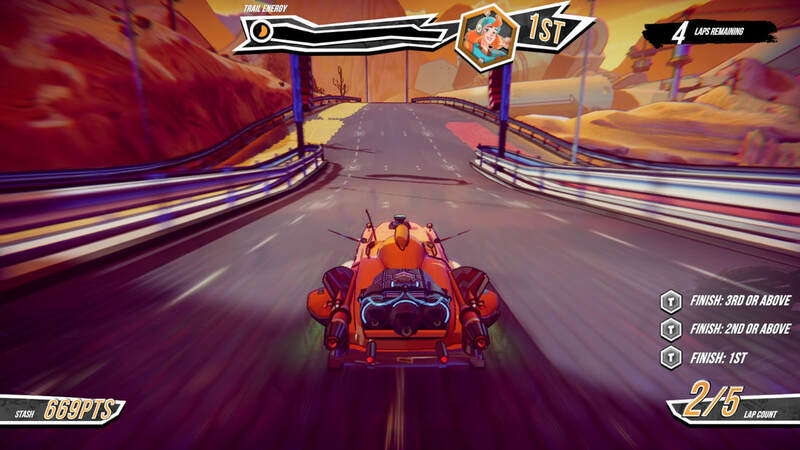 Trailblazers, which can most concisely be described as the colourful love-child of F-Zero and Splatoon, ticks both boxes. That the development team behind the game consists of former Codemasters, Lionhead and Bizarre Creations alumni, does nothing to dampen its credentials. However, it also serves as a reminder that when games try to mash together disparate elements, they can prove a little too out there to make it all work. 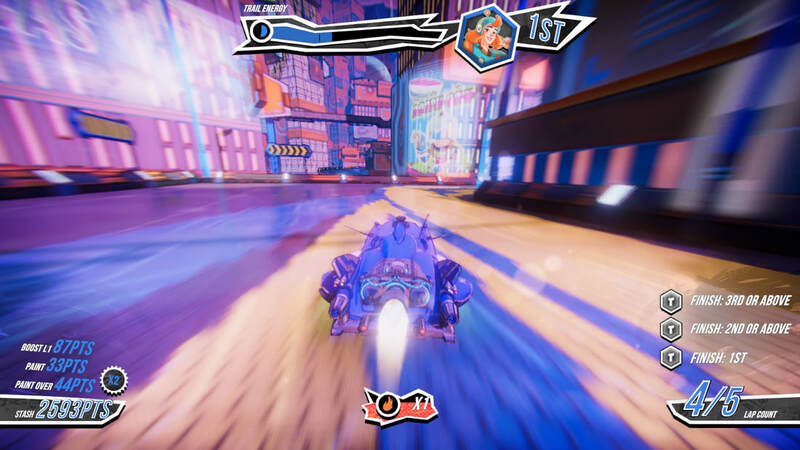 In layman’s terms, Trailblazers is a futuristic racer whereby the main twist comes from painting the circuits as you drive, creating boosting lines that, next lap around (provided they haven’t been vandalised by competitors), grant additional speed, and points bonuses. Six competitors race in each event, either on their own, in a pair, or as a trio. Winners and losers are determined by a mixture of race performance, painting prowess and effectiveness at boosting. Sounds interesting, doesn’t it? That it turns out to be a middling game is not indicative of uninspired mediocrity, but a patchwork of highs and lows. There are moments when Trailblazers seems genuinely inspired. Equally, it suffers from issues so basic, you’ll scarcely believe they weren’t remedied. It can be a lot of fun, but the player will also find ample opportunity to lament its careless design, and experience the frustration that comes with a game that harbours so many interesting ideas, but doesn’t manage to bring them together effectively. Crafts handle okay, but they don’t offer a very technical experience. A lack of pace and some rather safe, slightly unadventurous track layouts leave things feeling a little sedentary. This may suit some, though be aware that, despite its sunny veneer, Trailblazers sports some highly competitive and uncompromising opponents. Accruing combos and points through painting and boosting is a great idea, though erasing your accumulating tallies for clipping a competitor or barriers is wholly unnecessary, in effect encouraging you to deliberately break the chain to bank your points. Resetting the multiplier would have been enough. 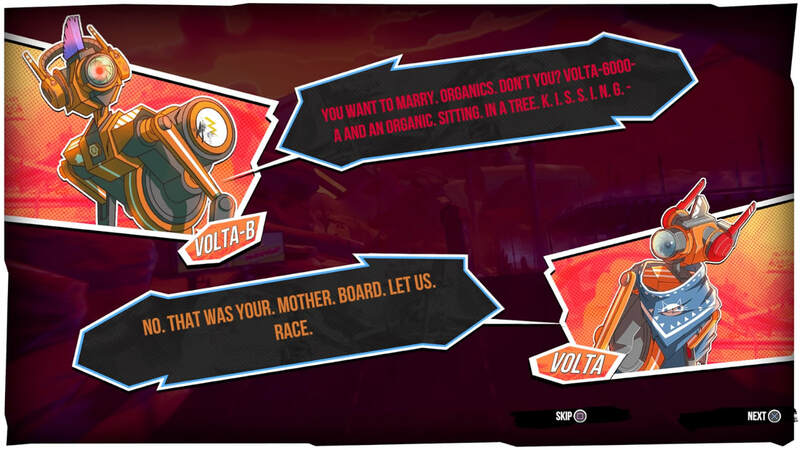 Trailblazers shows off its eclectic style and myriad race setups through a Story mode. Here, you’ll meet a familiar troop of dysfunctional humans, aliens and robots. Wisely, Supergonk have limited narrative elements to a measured minimum, producing a few funny quips, which are tempered by some trite exchanges. The story provides around 25 chapters, which are mostly single events with a trio of objectives attached, many of which have little to do with achieving a good result, oddly. Clear these, and you’ll be rewarded with a number of three-to-four race cups. These offer a decent challenge, but rather expose the game’s lack of direction in design. 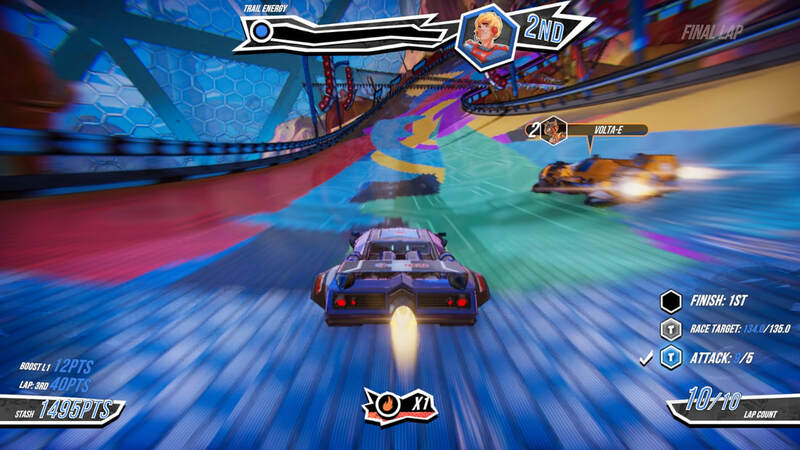 Cups require only that the player finishes first on the track, though oddly, events are staged as 3v3 team races. It’s quite possible to be on the winning team and outscore all other competitors individually, but if you find yourself being pipped to the finish by a so-called teammate, you won’t collect the three tokens up for grabs. Furthermore, there’s no on-going points tally, which rather renders the tournament aspect a waste of time. 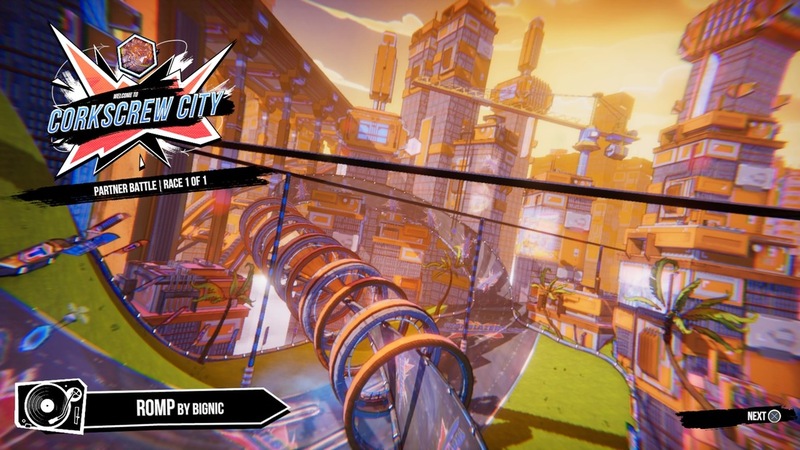 It’s hard to follow in the footsteps of games as distinctive as F-Zero and WipEout. 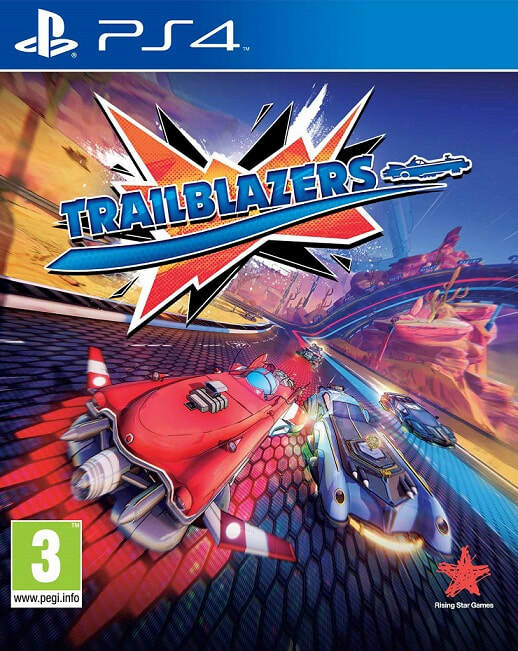 Whilst Trailblazers doesn’t quite live up to such titles in the gameplay stakes, it does craft its own identity, with a cracking soundtrack going some way to helping achieve this. In a genre that’s become an easy go-to for moody trance sounds, Supergonk have adopted a very different tone here. There’s upbeat, bright ‘n’ breezy efforts aplenty, with highlights including the Derevolutions’ joyous "Take it to the Hoop", and Bignic’s crunching electronic dance track "Romp". They're part of a small but immaculate selection. By trying to accommodate race results, painting proficiency and boosting, it’s difficult for Trailblazers to make a convincing case for all of its ideas. It struggles with the bread and butter stuff, such as collision physics. Clashes with competitors, particularly at the beginnings of races, can be utterly torrid. Pangs with the scenery are even worse, as even grazing the barriers tends to result in your craft spearing from side-to-side, bouncing between barriers like a pinball. There are a few areas in which Trailblazers excels, however. Perhaps most impressive is how distinctive the game feels. It’s not afraid to deviate from themes that we’ve come to expect of the futuristic racer. An excellent, catchy soundtrack helps considerably, and together with its colourful visuals, helps eschew the more familiar, moody trance vibe that has become a go-to for such games. 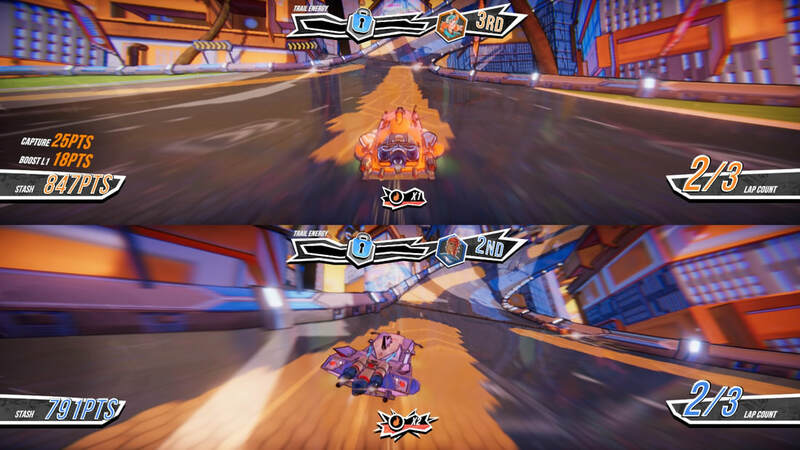 It’s also a lot more fun to play in split-screen multiplayer, perhaps because the communicative aspect means you can tackle the scoring system more effectively than if you were playing on your own. As with Redout, it’s a shame the two-player options don’t extend to the Story mode, as relying on help and consistency from the A.I. can prove vexing. The character selection is nice and varied, with some genuinely funny creations such as Boo (the hapless son who’s pressured into racing by an overbearing father, also happens to be an alien frog), though it isn’t an especially balanced line-up. It’s peculiar that Kiara, who pilots one of the most nimble ships, has a lower handling rating than Sid, whose truck’s manoeuvrability is comparable with a bus trying to navigate a supermarket. A little more content would also have helped. There’s just the ten circuits, and whilst they’re thematically quite nicely realised, only a couple prove genuinely engaging as a racing experience. Cup events merely exacerbate this. A set of races to round things off is decent idea, but having to repeat them all in mirror, reverse, and then reverse-mirror formats? It’s scraping the barrel a bit. 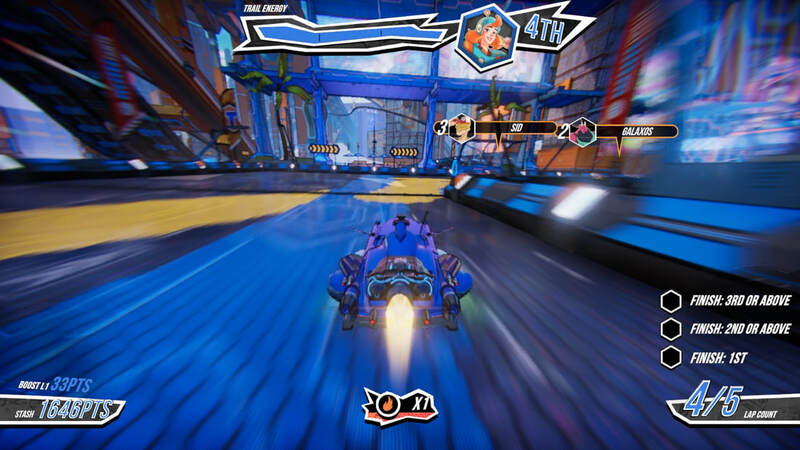 With a name like Trailblazers, you’d expect an imaginative and fresh approach to racing, and Supergonk have delivered this. However, there’s too many ideas in the melting pot and it ends up in limbo between a team-sport paint ‘em up and an out-and-out racer. Nevertheless, revisiting the concept would be most welcome, purely because it’s mostly simple issues that hold Trailblazers back. It is imperative, however, that the scoring system is applied more effectively if gamers are to get the most from the idea. "...an imaginative and fresh approach to racing. However, Trailblazers has too many ideas in the melting pot, and it doesn’t quite manage to bring them together effectively."